Fine art wedding photographers capturing love stories while writing our very own. We’ve been documenting weddings for over ten years focusing on the unique narrative between each individual couple. Our work reaches beyond beautiful imagery into a treasured experience. We focus on quality over quantity starting with you being one of only fifteen weddings for the year. Each step of our process is planned with your story in mind. We work to cultivate an experience based on relationships. Shouldn’t YOUR wedding images authentically represent your story? We think so … that’s why we want to get to know you and all of the treasured details. You’ve poured your heart into this day. Hiring a photography team that will mirror this effort is key to preserving that hard work. We implement thoughtful coaching and a playful spirit while simultaneously keeping the day on schedule. Oh, and no need to worry about “included hours” … our couples know that we are there from the first champagne pop to the final sparkler fizzles out. Our couples are worth more than a simple farewell and emailed link. Within weeks of your wedding, you and your guests are invited to attend this complimentary event where we reveal a lovely slideshow of your wedding day over bubbly and bites. 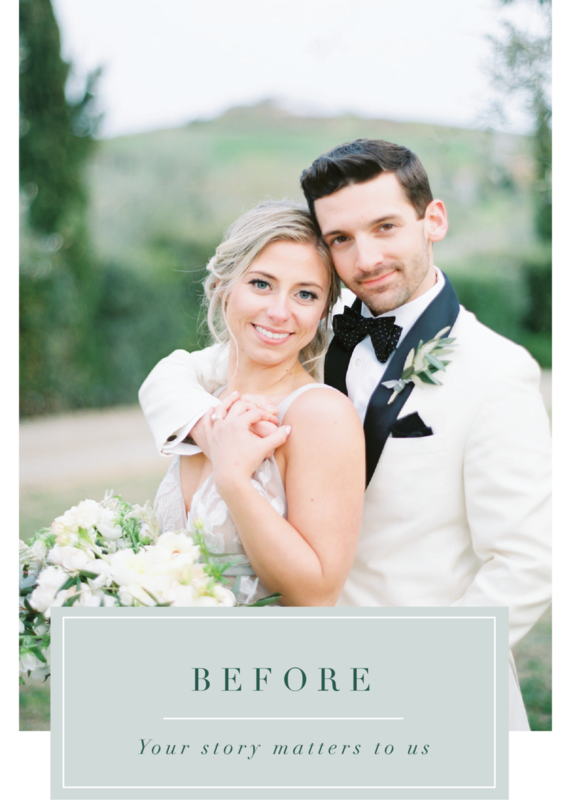 We will teach you how to use your gallery and explain all of the tangible offerings including our heirloom wedding albums. Loves Louboutins but treasures the memories made in them even more. She is up for travel if it means fine dining and manicured nails or paddle boarding and impromptu picnics. Appreciates the nicer things in life but places even more emphasis on being nice. Whether it is the meaning behind her something blue or the watercolored crest adorning her invitations, the ACP bride treasures the significant little touches. Wedding details are thrilling, but she is truly overjoyed at spending forever with her best friend. She adores his real smile (we know the difference, too, friend ;), the way he says her name and the safety his arms provide. She wants both beautiful pictures AND an unforgettable experience. Our brides find refuge in the carefully curated experience from initial contact to final delivery.